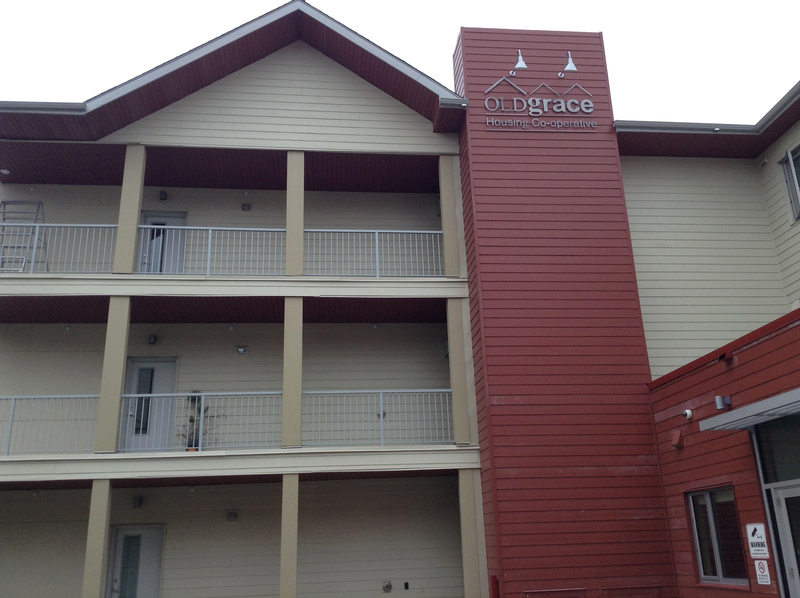 New home for people, new home for threatened birds – Old Grace Housing Co-operative Ltd. The Old Grace Housing Co-operatives’s Chimney Swift Habitat (red tower on the right side of photograph). Old Grace Housing Co-op is intended as both an environmentally sustainable, housing co-operative for people and a nesting and roosting site for the Chimney Swift, a provincially and nationally designated threatened bird species that breed in southern Manitoba. The Chimney Swift (Chaetura pelagic) is a small, swallow-like bird that spends summers in North America, before departing for South America—particularly Peru, Ecuador, Brazil, and Colombia—in August. In Manitoba, Swifts nest in various southern urban centres, including Souris, Melita, and Winnipeg, though they are also found as far north as The Pas. Chimney Swifts spend much of their lives on the wing, eating up to 1,000 insects daily, caught in flight. Historically, these birds nested and roosted in hollow trees, but the clearing of old-growth forests throughout most of North America did away with much of their natural habitat. In response, Swifts adapted and began nesting in small masonry chimneys and roosting communally in large chimneys and smokestacks. When Chimney Swifts are migrating, they often gather at dusk and enter chimneys as a group. You can watch a video of a September 2014 gathering of Chimney Swifts at Winnipeg’s Assiniboine School by clicking here. Chimney Swift numbers have been declining in Canada for the past 50 years. In 2007, nesting Swift populations had declined to critically low numbers, prompting the Committee on the Status of Endangered Wildlife in Canada to list the Chimney Swift as a threatened species. Among the factors leading to the decline are the reductions in swift-friendly chimneys, as older heating systems are replaced and existing chimneys are fitted with metal liners and capped. The large chimney at the original Grace Hospital building was a well-used nesting spot for the Chimney Swift, with frequent sightings by Manitoba Wildlife and Fisheries Branch staff. When the Manitoba government decided to take down the building, the original plan was to leave the chimney in place. However, due to safety concerns, and in keeping with an exemption under Manitoba’s Endangered Species and Ecosystems Act, the chimney was removed in September 2014. In 2015, a 12-metre tall wooden chimney was put in place to serve as a temporary habitat for Chimney Swifts. This chimney, which was decorated by the students of Laura Secord School, was relocated to a permanent home at the Assiniboine Park Zoo in 2016. In an agreement with the Manitoba government, Old Grace Housing Co-operative constructed a new Chimney Swift habitat on the co-op site. The habitat is 12-metres tall, andconstructed of concrete block, with a fibre-cement lap siding. Wildlife and Fisheries Branch staff and volunteer observers with the Manitoba Chimney Swift Initiative will monitor the site for Chimney Swift activity. The Manitoba Chimney Swift Initiative co-ordinates a provincial campaign to educate Manitobans about the Chimney Swift and further its protection.